Have you heard of Potosí in Bolivia? Apart from being one of the highest cities in the world with an altitude of 4.090m, you should know it for once being the largest city in America. The reason for that is the Cerro Rico („the rich mountain“). In 1544 silver was discovered here and this was the start of a long story. In 1545, the Spanish conquerors started to extract silver from the mountain and it was said that there was enough silver to built a bridge from Potosí to Spain with it. Most of Spain´s wealth depended on the produces of Cerro Rico in Potosí. Due to this it has a beautiful colonial center. But this is not the main reason we came here. 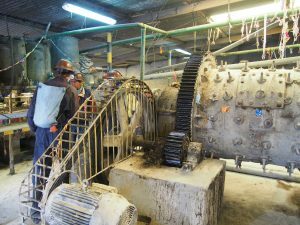 The mines´ output started to decline in the early 19th century, but the mines are still active and today around 6.000 miners work there every day. It is and always has been a job from hell. The altitude is more than 4.200m and the temperatures vary from freezing cold to 45°C on some levels. The miners are exposed to all kinds of chemicals and gases, and there life expectancy is very low, even today. Today, after five years in the mine they will definitely start to suffer from silicosis pneumonia and die within 10 to 15 years. In the period of the Spanish conquerors, all indigenous men as well as African slaves were forced to work in the mines. At some point, when the demand for silver was very high, they had to stay inside the mines for 6 months without seeing sunlight. Today, the miners are mainly independent (though belonging to cooperatives) and are paid according to the quantity and quality of the minerals they get out of the mountain. They work around six hours a day on five days a week. It is extremely worrying to know that most miners take their children with them when they are 10-12 years old during their school vacations. A tour to the mines – yes or no? 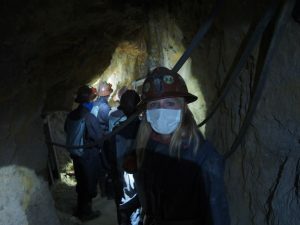 It is possible to visit the mines on a guided tour and it took us a long time to decide whether we should go for it. This was for many reasons. First of all, we thought it would feel like going to a zoo. Who wants tourists to pass their office every day, taking pictures? After a long talk to ex-miners we found out that they are actually proud of their job and of tourists visiting them and caring about their working conditions. Secondly, it is dangerous. You enter a working mine and there are chemicals and gases in the air. Miners use dynamite to exploit the minerals and rocks can fall at any time. And the third reason why we were not sure about going was that Sandra is a little claustrophobic. She had noticed at the Cu Chi Tunnels in Vietnam years ago. So she wasn´t sure she would be able to do it. 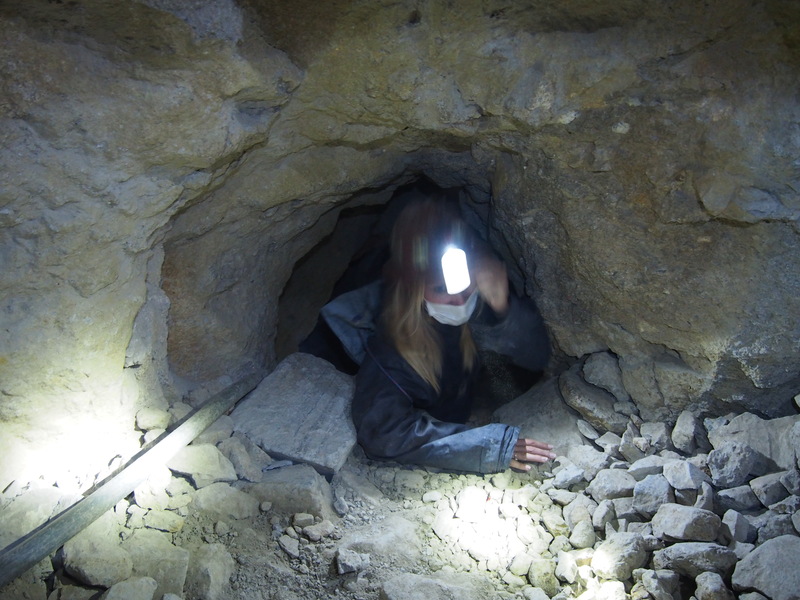 After talking to the ex-miners, who run an agency for mine tours, we got convinced. So we went on the most intense, scary and eye-opening tour we have been on during this whole trip. It is difficult to start writing about it. 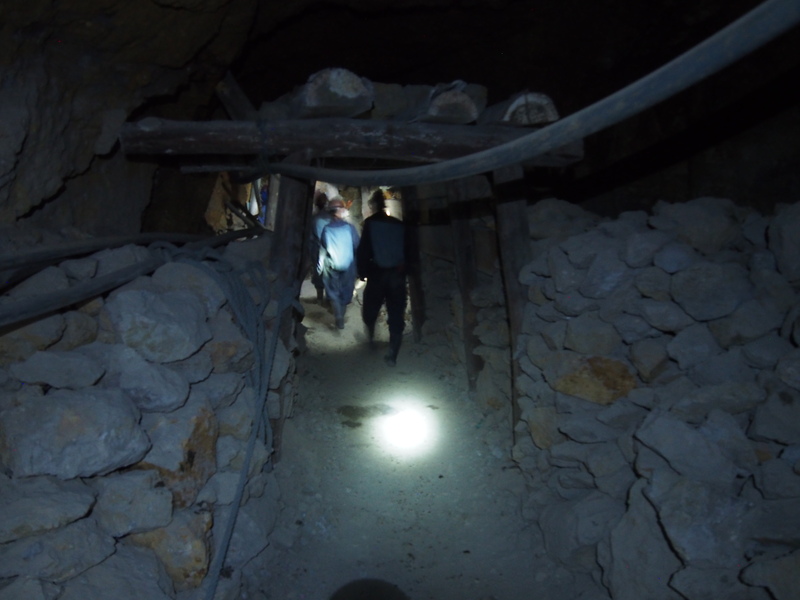 The narrow tunnels are tough, but seeing the life of the miners and hearing their stories is even tougher. But let´s try to start from the beginning. There is one big market for miners in Potosí. For a start, you need to know that they work independentely, so they also have to buy all their equipment. Of course they can´t afford the best equipment in the beginning, and only if they make good money they can buy better things. On the market you get everything miners need for their daily life. They chew coca leaves every time they enter the mine, in order to have a better oxygen supply. 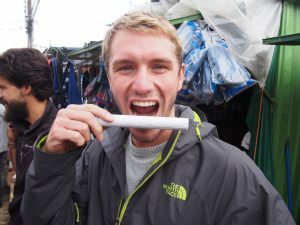 But you can also buy dynamite here, which they need to exploit the minerals. It is not possible to exploit them by hand. Holding dynamite in our hands was strange, but imagine you are in a tight tunnel inside a mountain and any mistake can kill you – or even worse, block your exit. 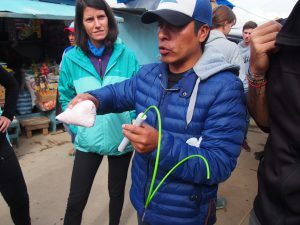 It is recommended to buy some gifts for the miners when entering the mines, so we bought some coca leaves and soft drinks. 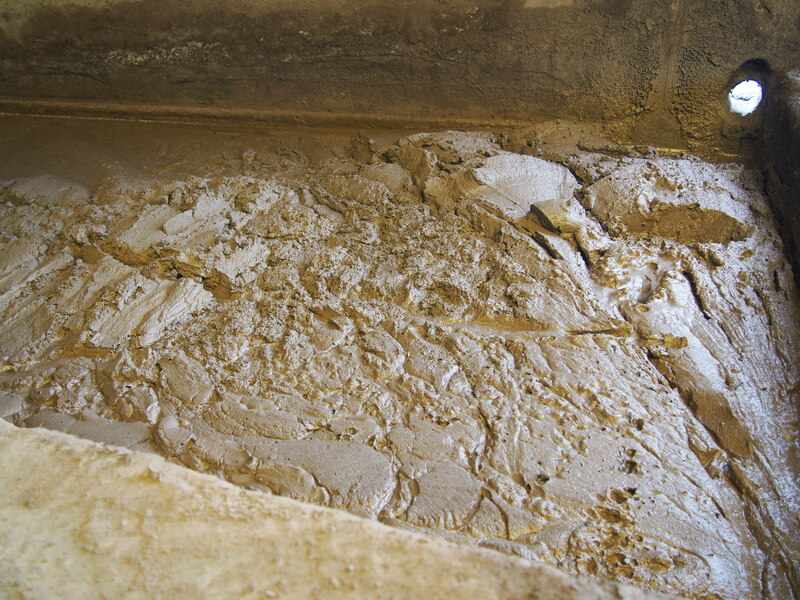 After the market we went to a refinery, where the minerals that are exploited from the mountain are being processed. We had to wear masks because the job is done using a lot of chemicals. Very often, the refineries are owned by foreign companies, so little of the money stays in Bolivia. Even if the refinery is owned by the cooperatives, they do not have the technology to process the minerals into a pure state. 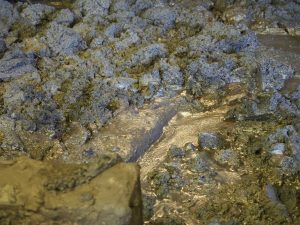 For example, the silver they processed in the refinery we went to is worth 30€ per kilo. 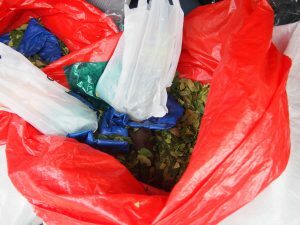 It is then exported to Europe, the US, China or Japan for further processings. It is crazy to see that Bolivia owns all these valuable minerals and is still so poor. Our next stop was the mine itself. 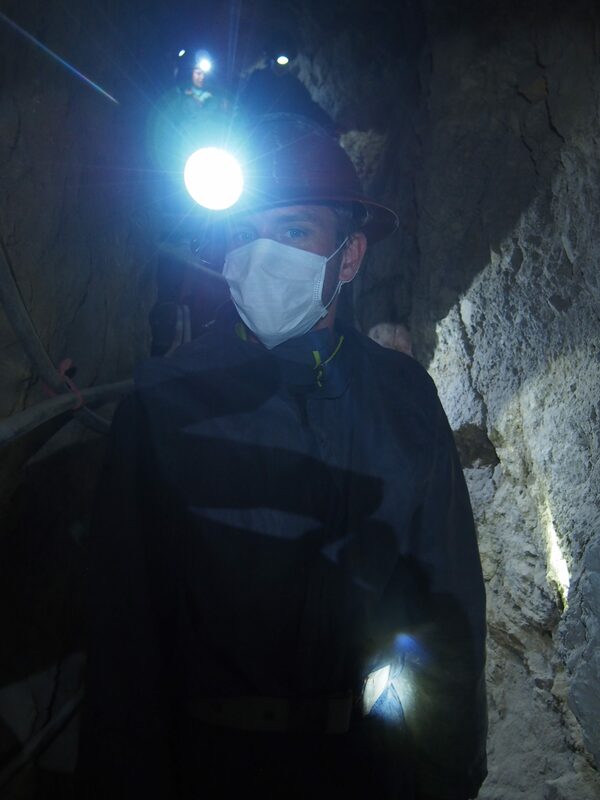 We will try to tell you about our own experience as well as the things we learned about the miners. The entrance to the mine is small, but after about 20 meters you can stand up. For Sandra, it was already hard to enter, but once inside and standing up it wasn´t too bad. We had one guide going in front of us, and one going behind. The one behind was there to help people on their way out in case they got scared. Sandra stayed with our guide Gina all the time. Having no one behind you and knowing that there is a way out quickly reassured her. It is a strange feeling to be inside a mountain in the dark. We all had helmets, lamps and masks. At one point we sat down for a little talk and right next to us some small stones dropped. It reminded us how easily things could happen. After a while of walking flat we wanted to go to a higher place to visit one miner. It was a steep staircase up and afterwards the tunnel got narrower and narrower. After jumping over a big hole in the floor, we looked up and saw a reall small hole through which we needed to climb. When Sandra saw this, she got a serious panic attack and couldn´t breath. This has never happened before in any situation, but this was really extreme. The guides made her smell 96% alcohol in order to calm down. It took a few minutes until she was able to move on. 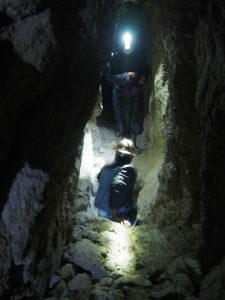 It was a huge achievement to crawl through this hole, many people don´t go. Afterwards the tunnel stayed very narrow and scary. For Sandra, it was torture to stay in there and she was very relieved when we got out the same way we got in. These mines are a serious issue and if you really suffer from claustrophoby, you shouldn´t enter. We spent about 1,5 hours in there and everyone in our group was lucky to get out. None of us could imagine staying in there for days or even months. We went on the tour with an ex-miner. As we said before, the job is really dangerous. 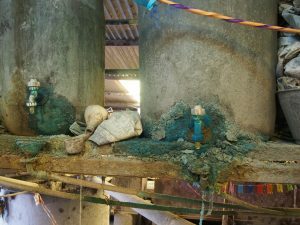 But the worst part is that everyone staying in there for long will die from silicosis. Our guide had started to work inside the mines when he was 13 and at 36 he started to feel the illness. He told us that most miners are not scared of dying inside the mine, they are scared of the slow and painful death that the illness brings along. 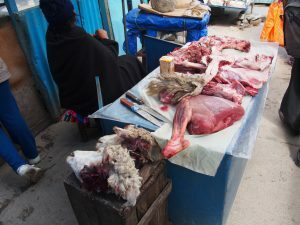 Even though there are so many sick people in the city, there isn´t one good hospital and only few people can afford going to an expensive hospital in Sucre. 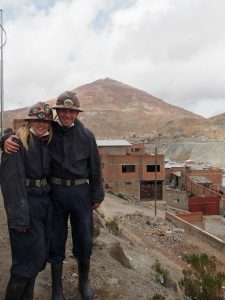 Most miners are „socios“ (members) to a cooperativa. To become a socio, there is a referendum in the cooperativa. If a miner is known to drink too much or to start fights quickly, he won´t be accepted. 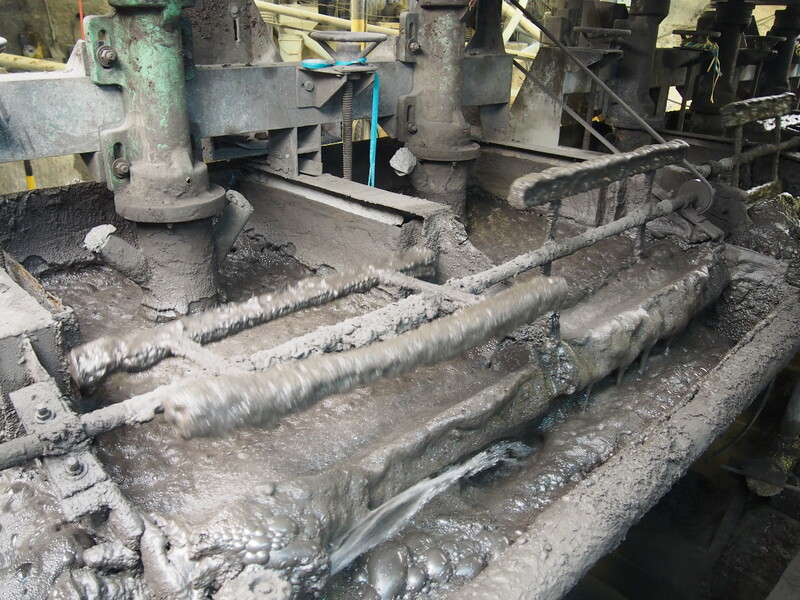 This is a way to control the conditions in the mine. 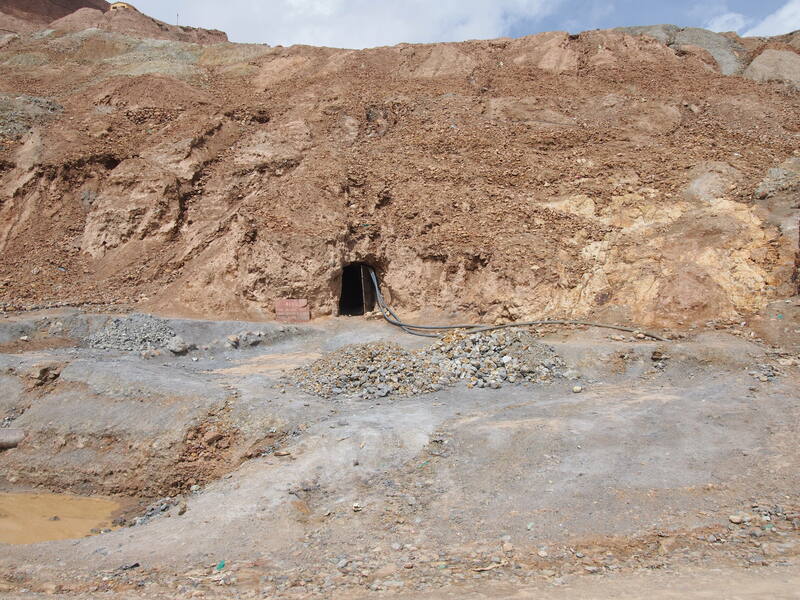 Each miner works independentely and are paid according to the quantity and quality of the minerals like silver or zinc the exploit from the mountain. 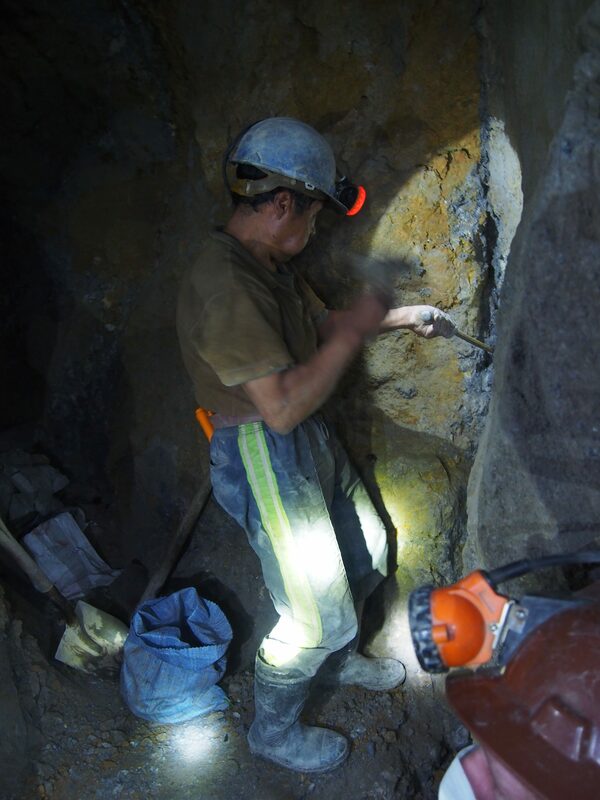 Most miners of the cooperative own a part of the mine, which they exploit on their own. If a territory belongs to one miner, others don´t enter. The one worker we visited owned a part with poor quality of minerals and he only earned 50 Bolivianos (7€) for 50kg he carried out of the mountain!! Another miner was only paid for every 8 tons of minerals he exploited from the mountain. Do you get an idea of how hard this job is? 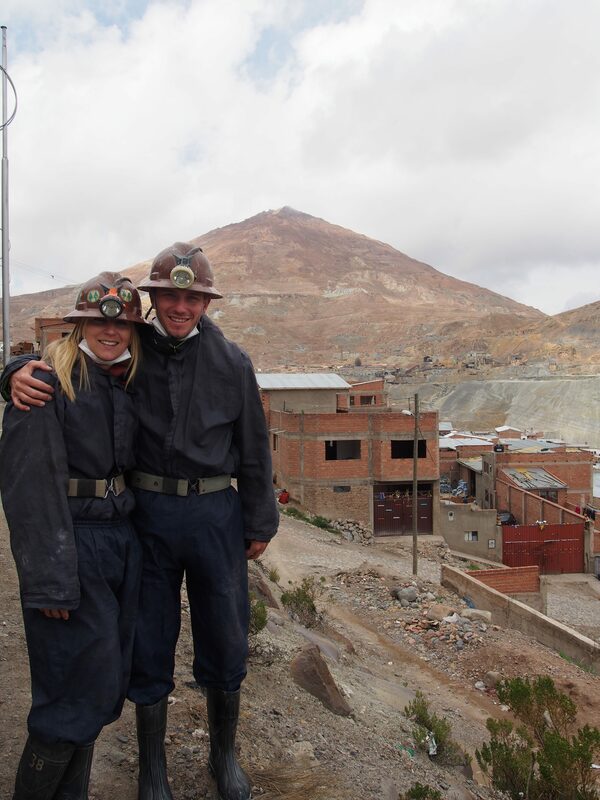 Our guide told us that all miners keep a positive and optimistic attitude, hoping to find enough silver to change their life. Of course, this rarely happens. Women are not allowed to work in the mines, because miners believe that Pachamama (Mother Earth) will become jealous and accidents will happen inside the mountain. 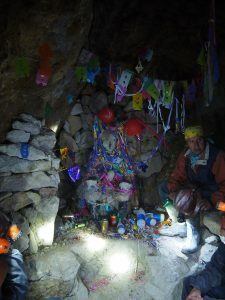 Their god is „El Tio“ whose statue is inside the mountain. 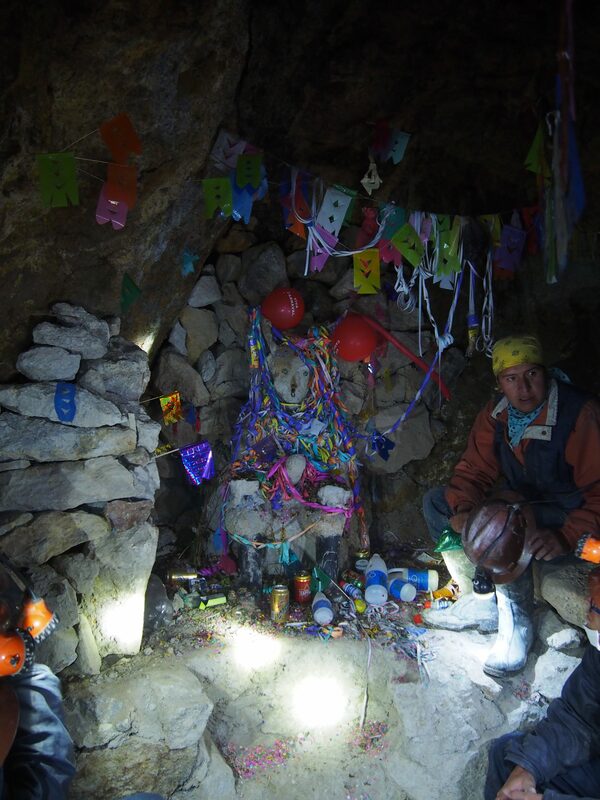 Every friday, miners gather and sacrifies cigarettes, alcohol and coca leaves to El Tio. We also sat down next to El Tio and the guide asked him a favor for each of us. For all the three couples in the group he prayed for our fertility because he couldn´t believe we all were together for a few years already and didn´t have kids yet 😉 We then tried the 96% alcohol that the miners drink – disgusting! 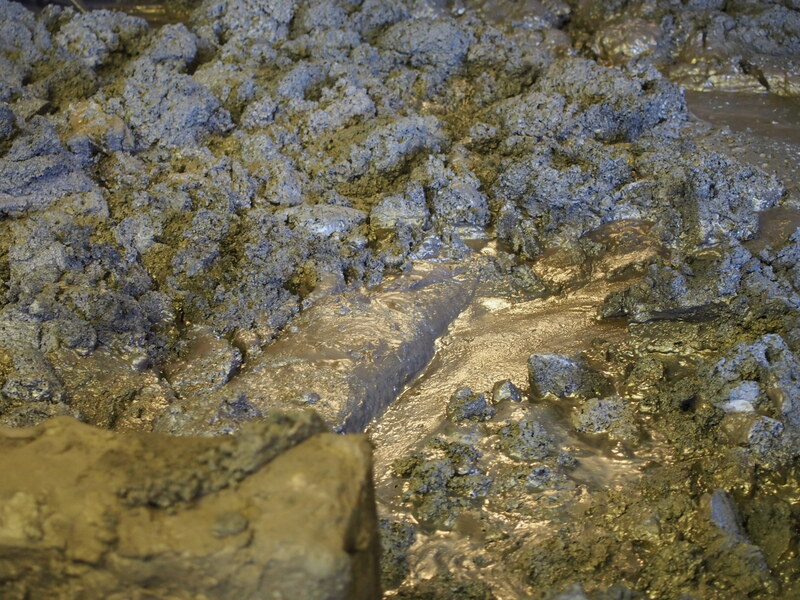 Many people say that within the next 20-30 years there will be no more minerals to exploit. Even though people suffer from working in the mines, they fear this moment. The mine is their basis of existence, and the whole city of Potosí wouldn´t exist without the mines. With the end of the mines the future of the city is unclear. 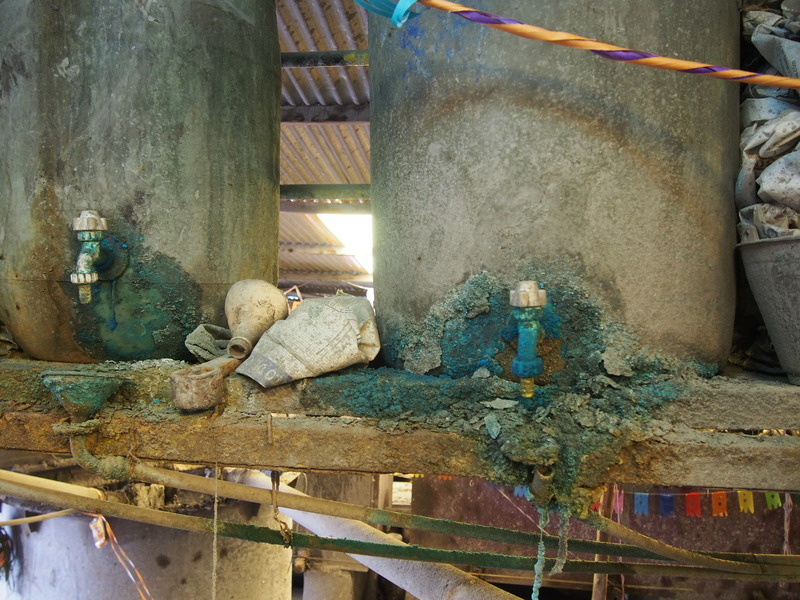 The visit to the mines left us speechless. 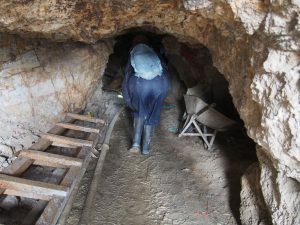 The hard working conditions, almost no money stays in the country and especially with the miners, medical conditions for the sick miners are terrible. Still, they always stay optimistic, and all of us should be more like that. Also, we should think about these men everytime we buy jewellery and complain about the expensive price. The people that deserve it the most do not earn much of that.